Gum Disease & Alzheimer's: How Are They Linked? For family caregivers tending to seniors with Alzheimer’s, oral care may not take precedence. However, new studies suggest there may be a connection between gum disease and cognitive decline. In fact, gum disease may actually speed up the progression of Alzheimer’s disease. Oral hygiene is especially crucial for seniors with Alzheimer’s. When the teeth or dentures aren’t receiving regular care, seniors can develop serious health issues, ranging from infections to pneumonia. When an infection develops in the mouth, it often spreads throughout the body. When the body reacts to the infection, it can have serious consequences for seniors with Alzheimer’s. Oral infections can adversely affect your loved one’s health, wellbeing, and overall quality of life. Seniors who want to remain healthy as they age can benefit in a variety of ways when they receive professional non-medical at-home care. Sacramento, California, Home Care Assistance is here to help your loved one accomplish daily tasks, prevent illness, and focus on living a healthier and more fulfilling life. When a senior develops gum disease, there are many consequences if it goes untreated. The resulting pain may leave seniors unwilling or unable to eat, which can diminish overall health. Gum disease can also cause periodontitis, a condition where the gums swell and teeth rot and fall out. Tooth infections are another common consequence of gum disease, which can cause delirium, a state of confusion that leads to behavioral issues. This can be confusing for family caregivers, as it may be difficult to differentiate between behaviors caused by Alzheimer’s and those caused by infection-induced delirium, and caregivers may not notice oral infections until it’s too late. A recent study explored the connection between gum disease and Alzheimer’s. The results found that when seniors with Alzheimer’s have gum disease, the rate of their cognitive decline has a six-fold increase. Scientists aren’t certain why gum disease has such an impact on Alzheimer’s, but they suspect the correlation is due to the body’s reaction to gum disease. When the body is battling an infection, all of its defenses are engaged. Scientists believe this defense response leads to the production of toxic plaques in the brain, a key indicator of Alzheimer’s progression. If your elderly loved one is living with Alzheimer’s and needs help managing the symptoms, turn to Home Care Assistance, a leading provider of Alzheimer’s care. Sacramento seniors can rely on our revolutionary Cognitive Therapeutics Method (CTM), an activities-based program that promotes cognitive health and delays the onset of Alzheimer’s disease. CTM also encourages seniors to engage with others in an enjoyable way and helps them build new routines to look forward to. 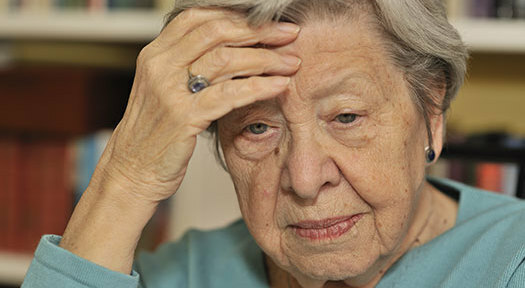 Seniors with Alzheimer’s are more likely to have gum disease than other older adults. Caregivers should be on the lookout for signs of oral infection. If routine teeth brushing causes the gums to bleed, the gums may be infected. Other signs include loose teeth and shiny, red gums. To ward off gum disease, caregivers need to help their senior loved one maintain healthy oral habits. The teeth and/or mouth should be brushed at least once a day. Flossing is also important. Dentures should be removed at night and soaked in water, and they should also be regularly cleaned with an appropriate denture cleaning solution. While helping with oral hygiene, caregivers should examine their loved one’s mouth for evidence of gum infections. Sores and white patches on the gums are signs it’s time to consult the dentist. Seniors can reduce their likelihood of developing gum disease and Alzheimer’s with the help of a professional in-home caregiver. A Sacramento caregiver can help your elderly loved one manage his or her health in a variety of ways. If your loved one needs encouragement to exercise more often, eat healthier foods, or socialize on a regular basis, an in-home caregiver can address these and many other health-related concerns. To create a comprehensive in-home care plan for your aging loved one, give Home Care Assistance a call at 916.706.0169 today.